I thoroughly disapprove of any attempt to assassinate India’s Prime Minister. The idea that Maoists could be considering this this raises my heckles. 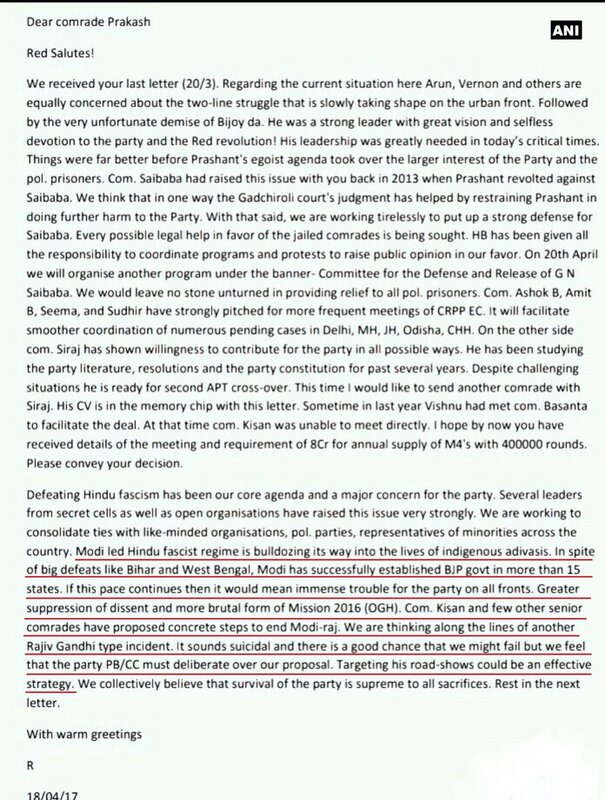 This letter was allegedly recovered from the house of Rona Wilson, the Delhi-based public relations secretary of the Committee for Release of Political Prisoners on 6 June 2018. It was apparently “seized from the laptop of Rona Wilson, a Delhi-based human rights activist“. Another news report claims this is not a letter but an “email“. The obvious problem with this text that’s been shared publicly is that the alleged email DOES NOT HAVE ANY IP ADDRESS [Source]. Question 1: Why doesn’t the letter look like a proper email? Question 2: If these guys were plotting Modi’s death, why would they not use readily available and foolproof encrypted systems like Whatsapp? Question 3: There are significant tampering issues involved here (see this). It is allegedly signed “R” – is that short for Rona Wilson? I’ve concluded after spending a couple of hours that there is a high chance that the letter is FAKE. Here is PS Jha’s critque. According to Jha, “the letter contains virtually irrefutable evidence of having been doctored“. Rao said that all the letters were fake and there was an attempt to link the Maoists to the Bhima-Koregaon violence. This raises a number of obvious discrepancies. The quora response cites REAL Maoist letters which read totally differently, and not a rambling self-disclosure. With that said, we are working tirelessly to put up a strong defense for Saibaba. Every possible legal help in favour of the jailed comrades is being sought. HB has been given all the responsibility to coordinate programmes and protests to raise public opinion in our favour. On the other side Com. Siraj has shown willingness to contribute for the party in all possible ways. He has been studying the party literature, resolutions and the party constitution for the past several years. Despite challenging situations he is ready for second APT cross-over. Defeating Hindu fascism has been our core agenda [Sanjeev: This is highly implausible, as Jha points out] and a major concern for the party [Sanjeev: What Party?]. Several leaders from the secret cells [Sanjeev: If a cell is “secret” who in his right mind will mention it?] as well as open organisations have raised this issue very strongly. We are working to consolidate ties with like-minded organsiations, pol. Parties, representatives of minorities across the country. Modi led Hindu fascist regime is bulldozing it’s way into the lives of indigenous adivasis. In spite of big defeats like Bihar and West Bengal, Modi has successfully established BJP govt in more than 15 states. [Sanjeev: IS THIS NEWS FOR PRAKASH? WHY IS THIS BEING MENTIONED?] If this phase continues then it would mean immense trouble for the party on all fronts. Greater suppression of dissent and more brutal form of Mission 2016 (OGH). Com. Kisan and few other senior comrades have proposed concrete steps to end Modi-raj. We are thinking along the lines of another Rajiv Gandhi type incident. It sounds suicidal and there is a good chance that we might fail but we feel that the party PB/CC must deliberate over our proposal. Targeting his road shows could be one effective strategy. We collectively believe that survival of the party is supreme to all sacrifices. Rest in the next letter. « Should communists have freedom of speech? or should they be arrested at the drop of a hat on trumped charges?